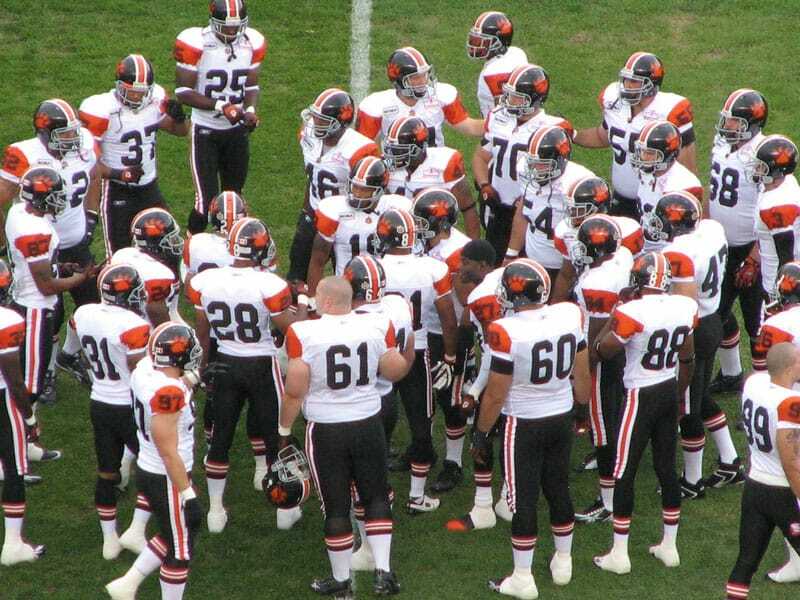 I’ve been a CFL fan, and a BC Lions fan in particular, for most of my life. When I was a child, my parents took me to games at Empire Stadium. Later, I attended games at BC Place. My mother was an Edmonton Eskimos fan and used to torture the family by screaming as she watched them on TV. She must have been happy in those years, as some of my earliest CFL memories included the Eskimos hosting the Grey Cup. Unfortunately, none of my friends were interested in going to games and most of my thirst for the Lions and the League in general were satisfied through newspapers and television. That was until 2002. It was in that year that I met other fans through the internet and in 2003 I was back under the dome, attending games. By 2004 I had bought my own season tickets. One of the greatest pleasures I’ve experienced since returning to games has been the wonderful people I have met across Canada. I have made friends and acquaintances from, literally, every CFL city. Over the last few years, many of these people have become good friends, and we routinely visit each other throughout the regular season and every year during Grey Cup week. This latest road trip took me to the province of Alberta – to both the Eskimo Empire and the land of the tailgate party in city of the Grey Cup Champion Calgary Stampeders. The following words and pictures tell that story. My flight is at 7:00 am so it’s up early. It’s funny how when you go on a trip you have no trouble waking up. The flight to Edmonton is great – just over an hour long. I am greeted at the airport by Brian Edwards, a long time CFL and Edmonton Eskimo fan. Brian and his wife Linda are gracious hosts every time I visit their city. Our day starts with a little breakfast, followed by a trip across Edmonton’s high level bridge on an old Japanese streetcar. The streetcar was built in 1921 and then rebuilt in 1947. It remained in service in Osaka until 1990, before coming to Edmonton. The train leaves from a location near the old landmark Strathcona hotel. It travels over the High Level Bridge and back, providing a breathtaking view of the city and the North Saskatchewan River. The Famous Bulldog at Julio's Barrio on Whyte Ave. It was a hot trip, so from there it was a no-brainer that we hit Julio’s Barrio on Whyte Avenue for some lunch and a few Bulldogs. 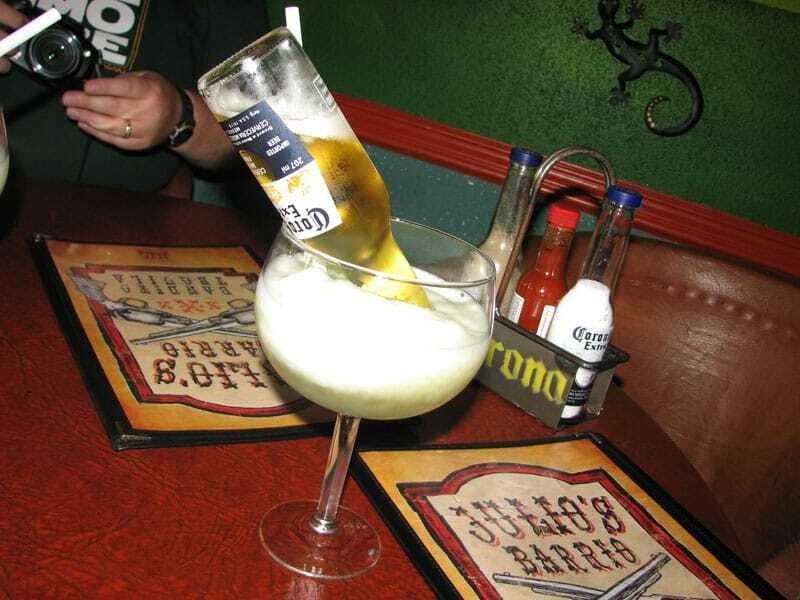 Bulldogs are double margaritas with a bottle of Corona placed upside down in the glass. Let me just say…tasty and potent folks! Julio’s is a must stop for me on every trip to Edmonton. I was also thinking that stopping for drinks on Whyte Avenue will be good karma for new Lions kicker Sean Whyte, who would start his first CFL game that night. After returning home and having a brief rest…err letting the Bulldogs wear off, it was off to Commonwealth for the Lions vs. the Eskimos. The Lions have gone 2 and 2 at the games I’ve attended at Commonwealth. It’s a great place to watch a game and it’s supposed to be nice tonight, so sitting outside in an open air stadium will be a treat. We arrive at Commonwealth around 6:30 pm. The atmosphere around the stadium is noticeably retro. The 60’s version of the Eskimos fight song is playing. Cheerleaders are dressed like they were in the 60’s – shiny gold suits with big belts and headbands. They look really good! Inside the stadium, I see lots of Lions fans in orange and black. As I get my first view of the field, I see the Lions warming up and instantly become a fan of the retro uniforms. It is, hands down, the best look I have seen the Lions wear. My Eskimo hosts tend to agree, and their team looks sharp as well. The game starts a bit slowly. However, after Buck Pierce goes out with an injury, the Lions pick it up with Jarious Jackson at the controls and go on to a big 40-22 win on the road. Despite the lop-sided win, the atmosphere in the stadium is great, the weather is awesome, and I realize on nights like this one outdoor football cannot be beat. After the game, we head to a downtown pub called 1905 to discuss the game and have a bite to eat. We run into another happy BC Lions fan who chats with us for a while. He’s a transplanted Lions fan from BC with Eskimo season tickets, so tonight he celebrates (but states the Eskimos are his second favorite team). After a nightcap back at my hosts’ place, it’s off to bed as tomorrow we drive to Calgary for Friday Night Football. During the drive to Calgary, we were entertained by the comedic talents of Russell Peters on the radio. We talked about stories of past CFL road and Grey Cup trips. Don McAskill has joined Brian and I for the trip, and I look forward to meeting up with friends in Calgary at the tailgate party – a huge highlight for me on any Calgary road trip. After checking in and waiting for our friend William “Hoof” Allen to arrive, I head over to meet friends on the west side of McMahon Stadium. As I stroll through the parking lot, the smell of barbeques fills the air – Canada’s best tailgate party is well under way. 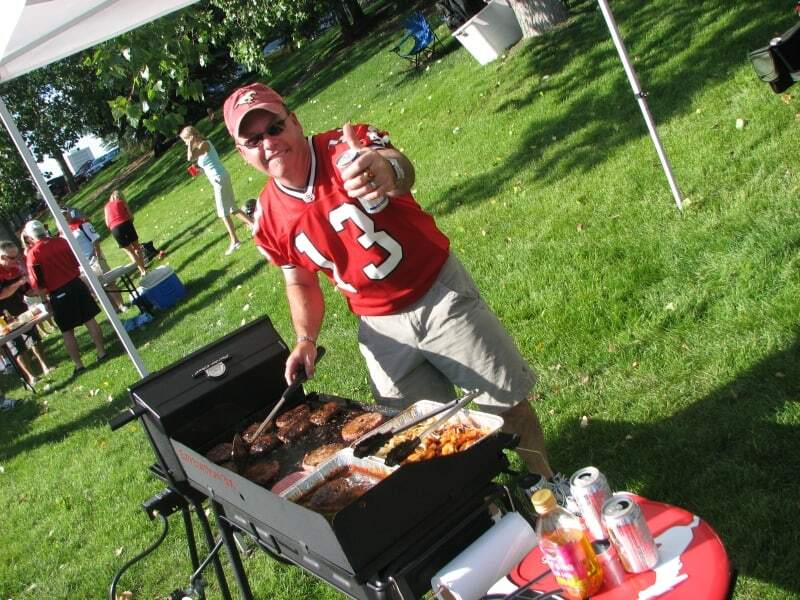 Elaborate tailgate setups are the norm here and there’s some serious grub being grilled throughout the lot. My new friend Ray hosts a mean tailgate party! Finally, I meet up with my old college friend, Brian Allan, his son Zach and his new wife Catherine. With them is Brian’s friend Ray, who’s been a regular at the tailgates for years and is known to put on a nice spread for friends and guests alike. I get to sample my first Spolumbo’s sausage, and it lives up to its famous reputation. TSN stops buy to do a promo shot of the sizzling grill and mock dust up between Ray and a visiting Argos fan. Thanks again to Brian and Ray for the hospitality they showed me that day and a great tailgate party experience. I head into the stadium and find I have great seats courtesy of Ken and Jacky Smith, two Stampeders fans who have moved away from Calgary but still keep their season tickets. They can’t make it to the game, so there I sit on the 50 yard line. I am joined by my friend Hoof, Jacky’s sister Rande, Rande’s husband Mike and their friend Ryan – great people who made it a really fun night. These two teams also look sharp in retro, although it took a while for me to warm up to Calgary’s. For some reason, the Argos were the only team with their names on their jerseys all weekend. Ralph the dog tried to steal my Lions hat, but I head faked him, took my hat off and put it on his head (much to the chagrin of fans around me). You have to be quicker than that Ralph! I think you need to get on the same training regiment as Leo the Lion! While in Calgary, I had the chance to visit another great CFL fan – Scott Oberg. Scott’s a great guy and I thank him for the hospitality he showed me. Following the game and some parking lot mingling, it was off to the Big T Barbeque across from McMahon for some delicious pulled pork and more banter among friends. This was followed by a few drinks at the hotel. Another great day of CFL football fun for the books! After driving back to Edmonton, we watch the Hamilton vs.Winnipeg game, followed by parts of the Saskatchewan vs.Montreal contest before heading out to dinner. My BlackBerry revealed that a storm may be heading to Edmonton and, sure enough, I got to witness a good old-fashioned prairie thunderstorm – complete with lightening, rain, hail and wind. The storm knocked out power to the Edwards’ house and surrounding area. From a spectator’s point of view, the light show was spectacular and the storm very impressive, but unfortunately it caused a lot of damage throughout the city. After a late night, it was off to bed for an early flight back to Vancouver. The best thing about being a CFL fan is the opportunity to meet other fans you from across the league, and then reunite with them, year after year, to share a common passion for Canadian football. At the end of the year, all of these friends gather at Grey Cup to celebrate the season, meet new people, develop new friendships and plan future road trips when we’ll meet again to enjoy the experience of the CFL. Take a look at the trip through photos!